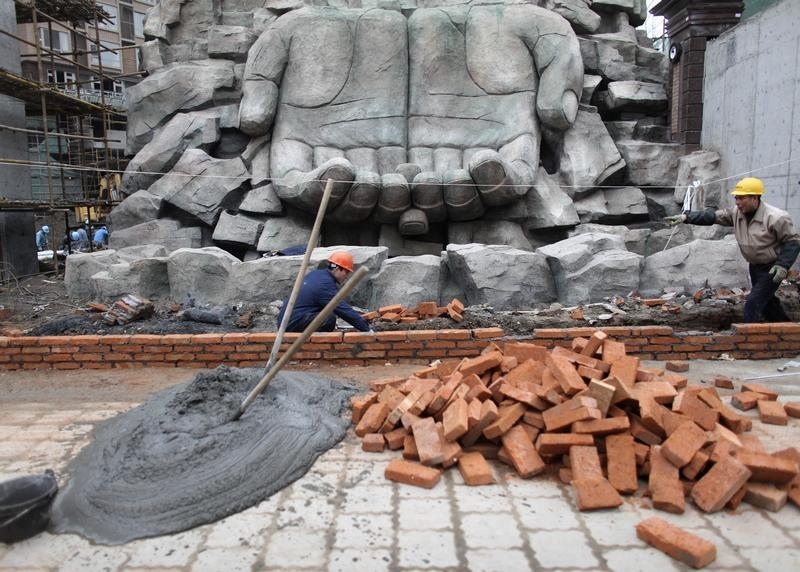 A Chinese building materials group is helping to firm up China’s sloppy cement industry. Beijing-based BBMG is injecting $2 billion of assets into Jidong Cement and taking control of its weaker rival’s parent company. This and other big deals are helping rationalise China’s glutted construction-goods industry – even if the M&A is often neither quick nor straightforward. Tackling overcapacity in coal, steel, cement, glass, aluminium and ship-making is key to President Xi Jinping’s “supply-side” reforms. After reckless expansion in China’s boom years, far too many plants are now idle: the country’s cement business used just 71 percent of its capacity last year, UBS reckons. Unused production is even greater in steel, coal and glass. Beijing wants the strong to take charge. In cement, that means the top ten producers will have 60 percent of the market by 2020, up from 53 percent now, according to UOB Kay Hian data. Bosses are listening. For example, China National Building Material (CNBM) and China National Materials Group have been talking about a “strategic reorganisation” since January. The latest deal, first trialed in April, will see BBMG buy 55 percent of unlisted Jidong Development for about 5.2 billion yuan ($780 million). The government of Tangshan, Jidong’s northeastern hometown, will own the rest. On June 29 BBMG fleshed out the second part of the transaction, saying it would swap cement assets valued at nearly 13 billion yuan for 45 percent of Shenzhen-listed affiliate Jidong Cement. The terms look reasonable. Citi analysts say the investment in Jidong Development implies an enterprise value of 308 yuan per tonne of cement at Jidong, in line with other recent deals. The combined group should benefit from healthy 60 percent-plus market share in and around Beijing. Still, the structure is fiddly, and the combined group will have to balance competing official interests in Beijing and Hebei. Consolidating big, listed groups might prove easier than persuading smaller non-public outfits to sell up. That limits the industry-wide scope for getting rid of excess supply. And there will be hiccups too: shares in West China Cement, another bid target, mysteriously crashed on June 28. They are now halted ahead of an update on a pending bid from Anhui Conch. It’s a reminder that, in China, even overdue consolidation is rarely straightforward. Beijing building materials specialist BBMG said on June 29 it had reached a deal to sell its cement and concrete businesses for stock in Shenzhen-listed Tangshan Jidong Cement, at a preliminary valuation of 12.95 billion yuan ($1.95 billion). Jidong Cement is also raising up to 3.0 billion yuan in fresh equity by selling shares to no more than 10 investors. Once both transactions are complete, BBMG will hold a 45.4 percent stake in Jidong Cement. The asset injection is part of a broader tie-up that has been under discussion for months. On May 31, BBMG said it had agreed to buy 4.75 billion yuan of new shares in Jidong Cement's unlisted parent company, Jidong Development, and buy a further 475 million yuan of existing shares. Those deals would give BBMG, which is listed in Shanghai and Hong Kong, 55 percent of Jidong Development. The remaining 45 percent is owned by the State-owned Assets Supervision and Administration Commission (SASAC) of Tangshan, a city in Hebei province to the east of Beijing. Jidong Development is also a major shareholder in Shenzhen-listed Jidong Equipment.